<>>. Generate barcode labels & images, Add-in to Excel / Word, print barcode to Avery label. Print barcode with multiple lines text, Support command line, Add Tab into barcode. Support all professional barcode printer, Laser & Ink Jet Printer, Label Designer. A. Print bulk barcode labels with common laser / inkjet printer to all kinds of label paper. B. Print Barcode Labels to Professional Barcode Printer. Free Online EAN-13 EAN-8 Check Digit Generator Online Sequence No. it can design complex labels contain barcodes, texts, logo, etc. and print bulk barcode labels. Your data is priceless, Please use our free file backup software >> Second Backup. Test your internet speed, Obtain evidence report, Send to ISP >> Network Ping Tester. A barcode is actually a special font, there are two types: 1D and 2D barcode, 1D barcode represented characters and numbers by varying the widths and spaces of parallel lines. Below barcode represented "ABCD12345678". This is 1D barcode. Below is one type of 2D barcode ---- QR Code, it can contain up to 4296 characters or 7089 numbers or images, etc. Our Barcode Generator support almost all barcode type. Barcodes originally were scanned by special optical scanners called barcode readers. Later applications software became available for devices that could read images, such as smart phones with cameras. There are multiple barcode types --- EAN-13, code 39, Code 128, QR Code, etc. You can use a professional barcode printer to print barcode label, but these barcode printer is expensive, it use our barcode generator software, you can choose to use a common office inkjet or laser printer to print barcode label. <4> Paper for print barcode label. You can use a professional self-adhesive label paper, or just use common office use A4, b5 paper, etc. Our barcode generator program support all type of label paper. 3. How to make barcode? You can print barcode label on ordinary A4 paper with a laser or inkjet printer for office use. The effect will be better if the sticky label paper such as Avery label paper are applied. It can also support the professional barcode printer. 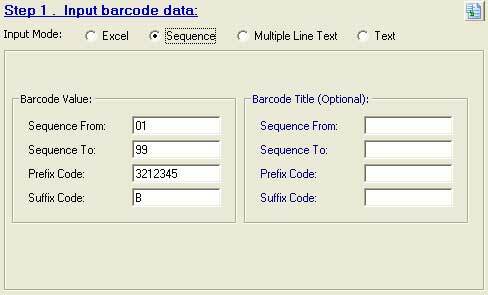 enter barcode data in batch text, sequence, Excel, etc. ** Barcode Generator program can print batch various barcodes on one paper, or export to many popular formats graphic files, or copied to the windows clipboard, they can be paste to the shipping label, invoice, etc. or import into desktop publishing software, word processing software or the reports program of the ERP, MIS system. Code 39, Code 128, ISBN, QR Code, etc. ** Specify the barcode size. ** Specify how many label print on one page. ***** With this barcode sheet generator software, both expensive bar code printer and professional label design software are unnecessary, and the bar code labels can be manufactured with the existing office resources. 5. 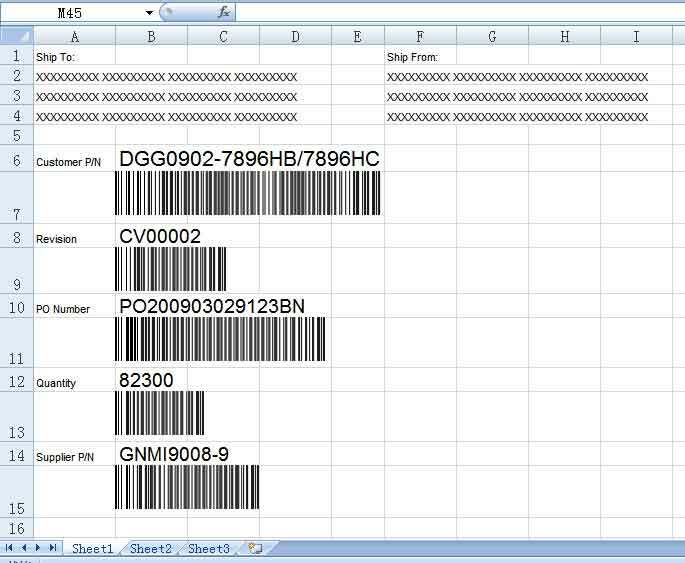 Add in to MS Excel a barcode design feature to make complex barcode label. The 2nd unique function of EasierSoft Barcode Generator is that the complex barcode label can be manufactured with the cooperative work between this barcode program and MS Excel or Word. A lot of contents are contained in some bar code labels such as shipping label, including shipping address, supplier information, the company's LOGO, etc. In the past, the professional bar code label design software are used to design and manufacture this kind of labels, but these software are expensive and complex. Now, EasierSoft Barcode Generator provides you a free and simple solution - designing and manufacturing this kind of bar code labels with MS Excel or Word. Because most of the people are skillful at applying Excel or Word, so it is not necessary to learn those complex and professional bar code label design software. Excel and Word are feasible, and its document format editing and printing function are very strong. The complex and exquisite label template can be manufactured with Excel or Word. Then, the bar code can be inserted into these templates with Barcode Generator software, and therefore, the professional bar code labels are output. ** Use ES Barcode Generator, you can add in the barcode label design feature to MS Excel. insert a barcode which number is "XXX9005-9" to this cell. ** If you want to let the barcode number equal the value of cell "B6", enter the function "Barcode(B6)". print barcode labels, and it has predefine some barcode label templates fro bulk barcodes generate. ***** This software almost supports all 1D and 2D bar code formats, such as EAN-13, Code 128, and QR Code, etc. 7. The full version software has more convenience on bulk / batch input barcode data. ***** ES Barcode Generator supports large batch of bar code labels' input and print. It requires you to input the contents of the hundreds of thousands of labels at one time, instead of one by one, then, bar code labels are printed with batches. The contents of bar code labels can also be input in Excel in advance, then, it is input in ES Barcode Generator, and bar code labels are generated and printed with batches. It makes your job more simple and more efficient. ES Barcode Generator support multiple data input modes. Click here to see the detail information and screen shot of the ES Barcode Generator. 8. Print barcode label with Zebra or other professional barcode printer. Example: Print barcode label with Zebra printer to a 4 X 2.5 " label paper. 1. Choose "Customize Paper", manually enter the paper width and height. 2. Columns = 1, Rows = 1. What is & How to Make Barcode . . .
Bar code is by far the most economical and practical an automatic identification technology. Bar code symbols as a means of identification can be used alone, can also be associated with the device identification system to achieve automatic identification, and other control equipment can be linked to achieve the automation of the entire system management. At the same time, in the absence of automatic identification equipment, but also to achieve manual keyboard input. Bar code symbol recognition device is simple in structure, easy to operate, no special training. Barcodes are easy to make and can be printed, known as "printable computer language". If you need to over print a barcode on existing forms, shipping labels, invoices, reports, etc. ES Barcode Generator & Overprinter can satisfy your requirement, just need a few quick mouse motions to set the print position, you can print barcodes on any existing forms. Financial News Today >>> EasierSoft Ltd presents a free application to print barcodes in all formats. ***** Customize Barcode Label Program Design Service.